Cynthia is twenty-one, bored and desperately waiting for something big to happen. Her striking fitness instructor, Anahera, is ready to throw in the towel on her job and marriage. With stolen money and a dog in tow they run away and buy ‘Baby’, an old boat docked in the Bay of Islands, where Cynthia dreams they will live in a state of love. But strange events on an empty island turn their life together in a different direction. 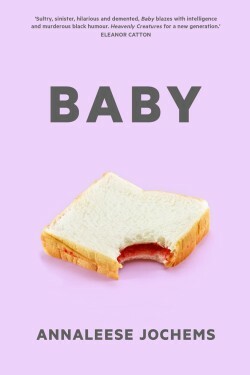 BABY is a sunburnt psychological thriller of obsession and escape by one of the most exciting new voices in New Zealand fiction. Right, let's lay this out right at the start. This is a marmite book with a capital M. It's full of dislikable, even noxious characters. The main protagonist is a self-absorbed millennial who seems fairly divorced from reality while semi-obsessed with reality TV, an unreliable narrator who snaps to judgement of others while having her own house in disorder. 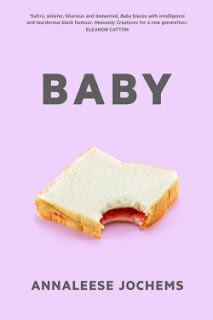 But despite all of that (and things that might annoy me in other books), for some reason, BABY just works for me. It's a heck of a read - intense and unsettling - and Jochems is quite the writing talent. And perhaps it's that writing talent that carries the day, allowing things to flow where they might go right off the rails into caricature or tedium in lesser hands. Jochems grabs the reader's attention from the start, luring us in, and adroitly cajoles us through some bizarre and disturbing places. We go willingly, even if it's not comfortable and often provokes plenty of scowls and furrowed brows. Cynthia is a former university student, we think (did she graduate or drop out? It's never quite clear. Or did she even go at all? ), who is drifting and rather aimless. She becomes obsessed with her fitness instructor Anahera, and fantasizes about future possibilities. When Anahera's marriage implodes and she needs to escape, the pair team up and head for the Bay of Islands, a scenic coastal area a couple of hours north of Auckland. Cynthia has funded their getaway with ill-gotten funds, but that doesn't matter because it's her life and her adventure, right? And Anahera is everything she wants. Or not. Jochems keeps us off-kilter throughout. We're never sure whether the view we're getting has much connection to reality, and there's always a lurking sense of unease. Like something horrible is about to happen, or has already happened off-stage and we've yet to find out. Is Cynthia really just an airheaded young dreamer who can't see beyond herself, or something much more sinister? Is Anahera taking advantage of her young admirer, or the one being taken advantage of? As the pages whir there's always a pulsing red light just out of view, danger, danger - but of what, and to whom? This is an unusual book. Jochems is a talented writer, but I can envisage some readers not 'getting' the book, and others disliking it or finding it 'too weird' even if they get it. Others, like myself, might find themselves greatly admiring the tale and hurtling through it, even if they never really empathisise with any of the characters. Did I enjoy the read? Enjoy is a tricky word with this one. BABY is unsettling, discomforting, off-kilter. I was fascinated by the read, is perhaps the best way to put it. There are a lot of themes weaving through what can seem like a rather simple storyline, adding layers and provoking plenty of thoughts. It's the kind of book that stays with you long after you close the final page. Jochems crafts an atmospheric, claustrophobic, sense of place and the unusual relationship between the two women and the other people they encounter on their adventure. Some questions are answered, others are left open. This is not your typical read, but it's an intense, extraordinarily clever psychological thriller that has hints of the likes of REBECCA or THE BIRD TRIBUNAL while being something quite original and all of its own. Give it a go and see what you think.